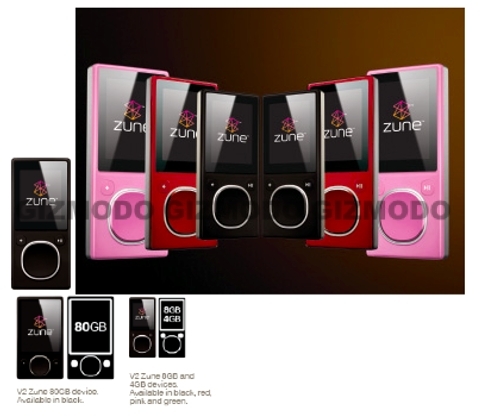 First Pics Of New Zune Line-Up | OhGizmo! Looks like the boys in Redmond are still pushing forward with their less than stellar media player by cooking up a new design and bumping the capacity to 80GB. The long rumored flash Zune also makes an appearance touting 4 and 8GB capacities. Aside from that awkward looking squarish button in the middle these don’t look half bad. This is sure to put all 12 Zune fans at ease. And I like the zune 1 a lot more designwise, did the screen shrink here by the way?